Senate Democrats Detonate 'Nuclear Option' To Curb Filibusters : The Two-Way The change makes it much harder for Republicans to filibuster many of President Obama's nominees. There was high drama Thursday on the floor of the Senate as Democrats significantly changed the way business in the chamber is done. In what Republicans cast as a "power grab" but Democrats defended as a way to break gridlock, the Senate's rules were changed to make it much more difficult for a minority of the members to hold up action on key presidential nominees. Voting 52-48 along almost strictly along party lines, the OK was given to new rules that mean it takes just a simple majority — 51 votes when all 100 senators are present — to cut off debate and move ahead on executive branch and judicial nominations (other than those to the Supreme Court). Previously, it took a "supermajority" — 60 or more votes — to move forward. As NPR's Brian Naylor says, the move pushed through by Senate Majority Leader Harry Reid, D-Nev., "was called the nuclear option because it has the potential to blow up already contentious relations between Republicans and Democrats in Congress." After the vote Republican Sen. John McCain of Arizona, who was part of a "gang of 14" that headed off a Republican attempt at a similar change in the rules a decade ago, said Democrats have now "by changing the rules by a majority have shown there are no rules in the Senate." Reid, he said, will be known for breaking "140 years of tradition." Reid, though, said during the day's debate that "the need for change is obvious." Republicans, he said, had turned "advise and consent" into "deny and obstruct" as they blocked Obama's nominees. Just after 2 p.m. ET, President Obama praised the rules change. Republicans, he said, had been engaging in an "unprecedented pattern of obstruction" by holding up his judicial and executive branch nominees. "A majority of senators believe as I believe," he added, that "enough is enough." Senators, the president added, should vote their consciences — "but they should vote ... that's what they're there to do." An earlier update and our original post, with more background, follow. Update at 12:36 p.m. ET: By a 52-48 vote the Senate on Thursday changed its rules to make it much more difficult for a minority party to block key presidential nominees. Deploying the so-called nuclear option to dramatically alter the way business is done, Democrats successfully pushed through a landmark change. Going forward, they will need just a simple majority vote — 51 or more — to cut off Republican efforts to hold up President Obama's choices for executive branches and all federal benches other than the Supreme Court. Senate Majority Leader Senator Harry Reid, D-Nev. 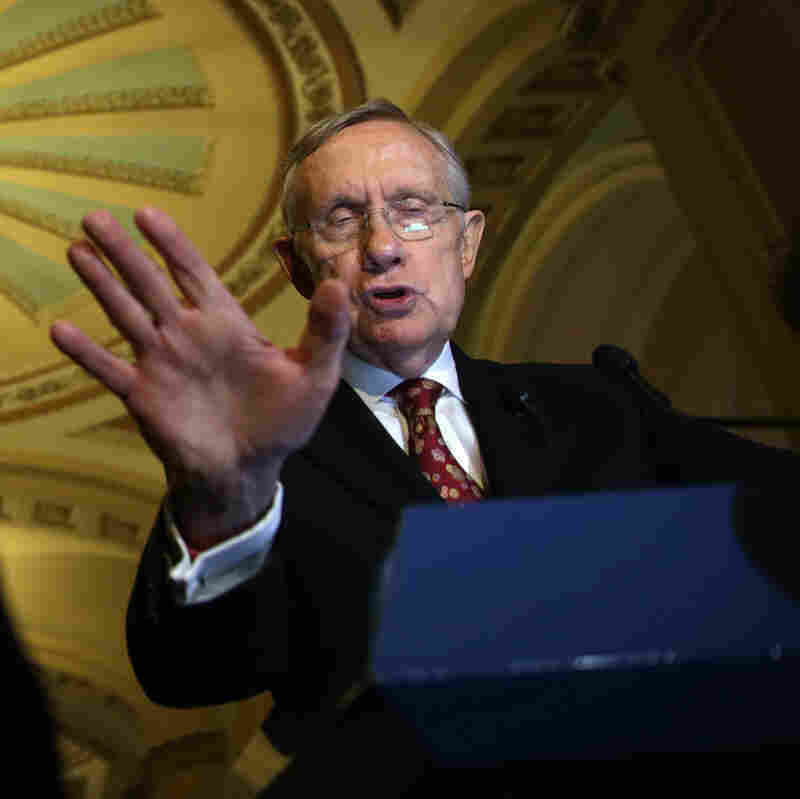 The debate has begun on the floor of the Senate over whether Majority Leader Harry Reid and his fellow Democrats can exercise the so-called nuclear option. That's the catchy name for a change in the Senate's rules that would make it much harder for Republicans to filibuster many of President Obama's nominees — most notably those he chooses for seats on federal courts. Need some background on it? Check this It's All Politics post by NPR's David Welna. Basically, Democrats are proposing that judicial nominations (except those for the Supreme Court) could no longer be blocked if 40 or more senators vote to hold up action. Instead, the rules would be changed to require a majority vote before action could be blocked. To put it another way, as The Associated Press reminds readers, under the rules Democrats want to change it takes 60 or more votes to cut off debate and move ahead on nominees. At this time, Democrats hold 53 of the chamber's seats and usually get the support of the Senate's two independents. So, if the 45 Republicans hold together, they can block action — with five votes to spare. Already this morning, Reid has made the case for changing the rules by accusing Republicans of turning "advise and consent" into "deny and obstruct" as they block Obama's nominees. Senate Minority Leader Mitch McConnell of Kentucky has responded by saying that Democrats promised they would not try to change the rules involving judicial nominations. Saying that Democrats are trying to wage a "fake fight over judges" to take attention away from problems plaguing the Affordable Care Act, McConnell said the other party misled Republicans. Democrats might just as well have said "if you like the rules of the Senate, you can keep them," McConnell quipped — a not-so-subtle reminder of President Obama's pledge to Americans that if they liked their health care plans, they could keep them. C-SPAN is streaming the action here.